A dot.com dropout discovers the gift of helping people find what they desire, need, and love. 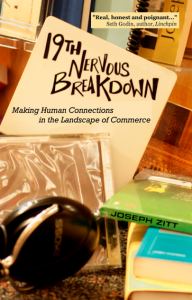 My new book, 19th Nervous Breakdown: Making Human Connections in the Landscape of Commerce, will be released on June 28th, 2011. The book, derived from the early days of my blog, speaks of the connections made among customers, workers, and other denizens in the unlikely world of retail. This is what I’ve learned as a book and music seller: In business relationships, we can’t simply approach the customer as an undifferentiated source from which we can wring out cash. Each encounter and transaction is a moment in a personal relationship, however fleeting. Each is as much a part of life as our connections within families, in romance, and with our coworkers. In working with customers, we discover and address their personal desires and open up areas in which we can turn them on to new possibilities, based on how we read their tastes and needs. Find out more and buy the book at the official website or order it through your favorite bookseller.